This post explores the excitement but frustation in researching a set of stained glass windows by different artists, with different patrons, of different dates and with no existing documentation or known facts (other than two plaques on walls and the inscriptions in the windows themselves). 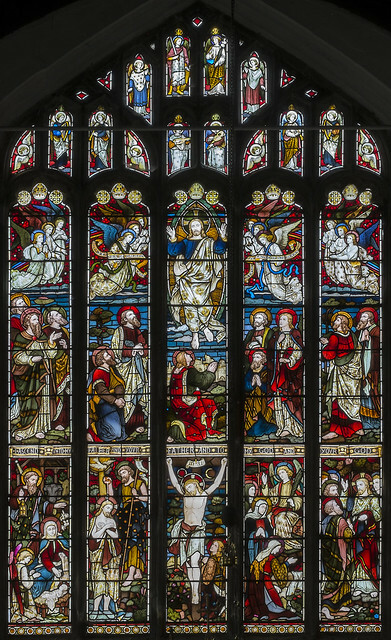 The stained glass of All Saints’ church in Stamford is beautiful, artistically accomplished and very well preserved. This is mostly due to the buildings continued liturgical function, but also because of the architectural and cultural interest of the town for visitors. 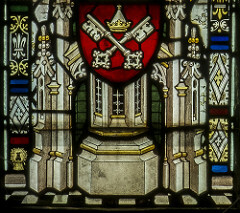 The decorated glass itself however has received next to no scholarly interest or even a mention in any one of the numerous publications written about the stained glass artists who produced these monuments for the church. I arrived at the church of All Saints by accident, having come to the town to visit another church to see an organ. I was helpfully advised that if I liked stained glass then I ought to pop my head into All Saints. I am glad I did because these windows are brilliant. After a quick discussion with the parish magazine editor I agreed to produce a document and guidebook for the church based on the glass. I started off eager and enthusiastic, taking high-definition photographs, booking myself into archives and asking advice from my former-course tutors. The more I looked into these lovely windows the more I realised that I had perhaps bitten off a little more than I could chew!! Every archive I contacted, every organisation I queried for information and every book I could find on the subject failed to mention All Saints, Stamford anywhere! After nearly a year of fluctuating success (and frustrating defeats) on this collection of Victorian and twentieth century wonders I can happily say my research has come to an end and I have completed the first draft of a book. I am delighted and very proud of myself. Below is a summary of my findings and some photographs. But if you want a full read of the final book you will have to wait for publication I’m afraid! 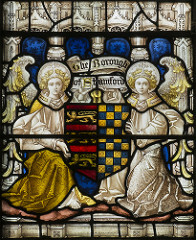 The existing stained glass of All Saints’, Stamford was installed over a period of sixty-two years; from 1874 to 1936. It is diverse in colour, design and iconography and brightens the church with a luminous display. The windows showcase works from some of the most well-known and talented stained glass artists of the period, and contain interesting scenes and characters. At one point the town would have had fourteen churches, including All Saints’. 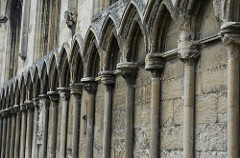 The earliest surviving fabric of the building is on the north side of the nave and probably dates from the twelfth century. The chancel, south chapel, nave and south aisle – noting the very fine arcading on the exterior of the south wall – are early-mid thirteenth century. The present tower on the north side, upper parts of the walls, clerestory, north vestry and rebuilt chancel arch are all fifteenth century, and are in the perpendicular style. This work was carried out with the patronage of John and William Browne, prominent wool merchants living in the town. The Victorian period encouraged the glorification and decoration of churches, and All Saints’ church benefitted enormously from this change of approach. 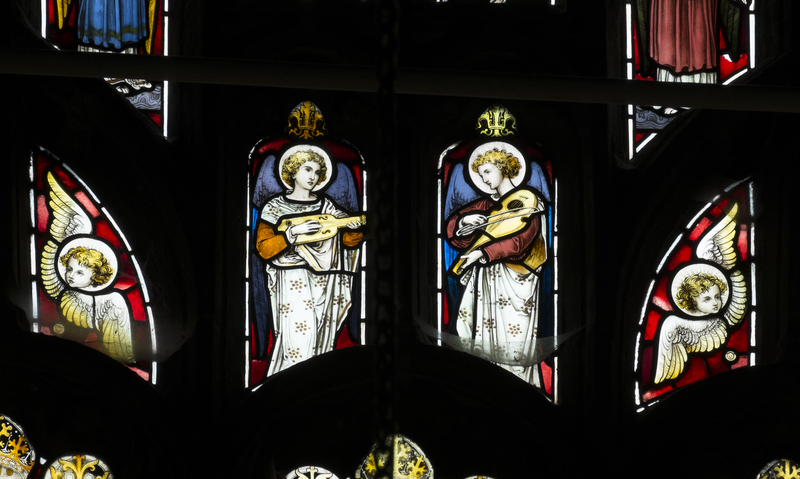 Wealthy patrons and families began installing windows in memory of their loved ones again; commencing in All Saints with the east window in 1874. Throughout the later nineteenth century more stained glass windows were added, culminating with a window commemorating members of the parish who fought and died in the First World War inserted in the early twentieth century. All Saints received co ntributions from Heaton, Butler and Bayne, Clayton and Bell, C.E. Kempe and Co., Shrigley and Hunt of Lancaster and A.K. Nicholson. Wealthy patron include former Rectors of the church, two separate families of ancestors of William Browne the fifteenth century patron of the church and a managing director and members of the Stamford, Spalding and Boston Building Society (now owned by Barclays). All glass in the church of All Saints represents a stage in its history. This includes the medieval fragments, the geometric plain glazing, the Victorian masterpieces and the more modern and artistically experimental twentieth century windows. The most interesting of all are the family stories represented by inscriptions and plaques, especially those connecting the church to the Browne family. American descendants of the famous John and William Browne visited the town of their ancestors separately, and both donated a fantastic window in memory of their ancestors.